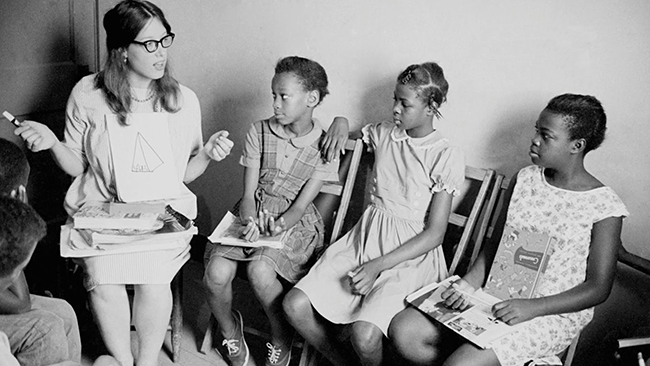 Susan Patterson, a Mississippi Summer Project volunteer, with students at a Freedom School, 1964. In August 1964 Patterson was arrested for “vagrancy” while teaching black students in a library in Hattiesburg. The charges were overturned by a U.S. Court of Appeals in 1968. Photo from the Civil Rights Movement Veterans website, Tougaloo College. Fifty years ago this month, in January 1964, the leadership of the Council of Federated Organizations approved a plan to bring hundreds of volunteers, mostly white Northerners and mostly college students, to Mississippi during the summer. The COFO had been established two years earlier to coordinate the efforts in the state by the four major civil rights groups: the National Association for the Advancement of Colored People, the Congress of Racial Equality, the Southern Christian Leadership Conference, and the Student Nonviolent Coordinating Committee. The Mississippi Summer Project, which came to be known as Freedom Summer, was the brainchild of the SNCC and was spearheaded by twenty-nine-year-old Robert Moses. In early June the first of approximately 550 volunteers began arriving in Mississippi to register voters, work in community centers, and teach in “Freedom Schools.” On June 21 three of the civil rights workers—James Chaney, Andrew Goodman, and Michael Schwerner—were murdered by Klansmen, aided and abetted by local law enforcement authorities. Undaunted by this tragedy, the total number of Freedom Summer volunteers swelled to nearly one thousand by the end of August. Alice Lake, a freelance journalist on assignment for Redbook, visited Madison County in Mississippi that summer and wrote about the efforts of three Freedom Summer volunteers: Ruth Kay Prickett, Karol Nelson, and Natalie Tompkins. Lake also had a personal interest in the summer’s events; her nineteen-year-old daughter, Ellen, attended the Oxford, Ohio, orientation session described in the article and then went to Gulfport to work as a volunteer at a voter registration project. Lake’s bracing story describing the experiences of the three Madison County volunteers was published in the November issue of Redbook. 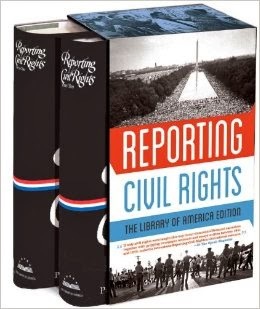 It had never been reprinted until it was included in The Library of America collection Reporting Civil Rights. In 2005 Karol Nelson McMahan, one of the three students portrayed in this selection, recorded her own memories of that summer in a brief article for Newsweek (PDF), published shortly after the belated conviction of Edgar Ray Killen, the KKK recruiter who coordinated the murders of Chaney, Goodman, and Schwerner. The dialogue occurred in July behind a small white country church with a single spire and a green roof. . . . If you don't see the full selection below, click here (PDF) or click here (Google Docs) to read it—free! One of the most moving, inspirational stories I've read in years. This story ought to be read by every American. Thank you for posting it.